An A-10 aircraft operated by the United States military suffered from a “catastrophic” engine failure during a routine refueling mission and was diverted to a base in Iraq to be repaired, the Pentagon says. The jet was not involved in a combat mission when the failure occurred, the Air Force said, but had to be diverted to a base in hostile territory where an expedited repair was ordered to fix the plane’s number one engine. According to the Hill, the Al Asad base in the largely-Sunni western province of Al Anbar was coming under "regular fire” from militants from the self-styled Islamic State (IS, formerly ISIS) as recently as this past January. Getting the A-10 out of Al Assad, Stohler said, was the “number one priority” for officials on the base. The Pentagon reportedly thought repairing the jet would take upwards of a month, the Air Force said, but a maintenance team was deployed to the base and fixed it in five days. “This fix required removing and replacing multiple major components on the aircraft that are normally not done,” he said. “It was accomplished in hot weather at a base with minimal support structure. The maintenance personnel slept 16 in a tent. There were no shower facilities. They worked long hours with minimal equipment to rebuild this aircraft, test it and then fly it out,” Stohler said. The Air Force plans to retire a fleet of around 300 Warthogs ‒ officially the A-10 Thunderbolt II ‒ over the next few years, and expects the maneuver to save the Pentagon upwards of $4.2 billion by 2019. The A-10 has previously been used extensively in the wars in Iraq and Afghanistan, and defense journalist Tyler Rogoway wrote recently that the jets would likely deal a heavy blow to the IS due to its sheer maneuverability, armor, defensive suite and construction. At the same time, the jet has garnered opposition from critics who cite a recent report indicating the A-10 has killed more US troops in friendly-fire incidents and more Afghan civilians than any other aircraft operated by the Pentagon. 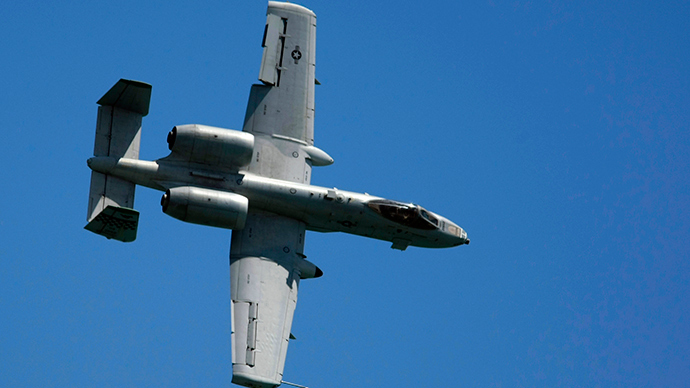 Earlier this week, lawmakers on Tactical Air and Land Forces subcommittee in the US House declined to weigh in on the fleet’s future, instead passing the fate of the program to a full committee that is expected to meet later this month and debate the A-10, according to Defense News. On Thursday, Roll Call reported that the House Armed Services Committee is expected to continue funding the planes through the 2016 defense authorization mark.